WASHINGTON — Former Vice-President Joseph R. Biden Jr. said Monday he made a mistake in supporting the tough-on-crime drug legislation of the 1980s and 1990s, expressing regret in particular over a bill that created different legal standards for powdered cocaine and street crack cocaine. His comments come as he is in the final stages of deciding whether to run for the presidency, and assessing what hurdles he would face in an increasingly progressive party. The former vice president appeared along with former New York City Mayor Michael R. Bloomberg at a breakfast in Washington celebrating the Martin Luther King Jr. holiday. While both men have been criticized for their mixed record on issues of racial equality and criminal justice, the two took different approaches to to explaining their record. Mr. Biden, who helped pass a 1994 crime bill that is now cited as having led to an era of mass incarceration, stunned the audience when he flatly admitted that he “may not have always gotten things right” in regards to criminal justice. But Mr. Bloomberg avoided any mention of the controversial policing tactic he implemented in New York called “stop-and-frisk,” which gave police officers sweeping powers to detain — and sometimes harrass — those suspected of committing crimes, particularly in neighborhoods that had predominately nonwhite residents. 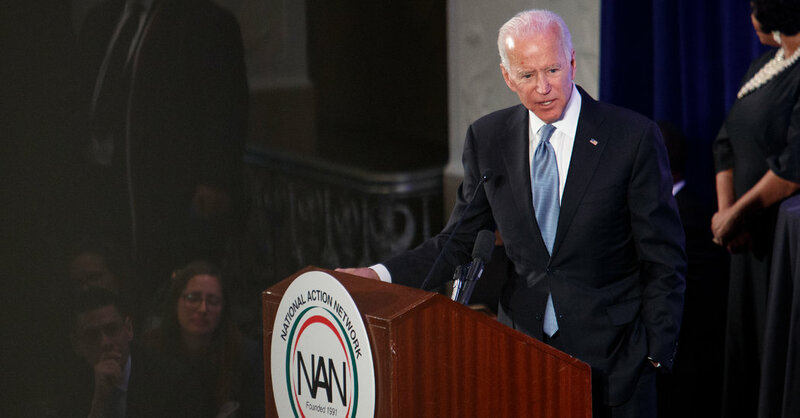 Prominent civil rights attorneys applauded Mr. Biden’s admission that his past actions on criminal justice were flawed. They also wished Mr. Bloomberg had done the same, they said. Mr. Biden’s comments were“appropriate and necessary. It was refreshing,” said Kristen Clarke, president & executive director of the National Lawyers’ Committee for Civil Rights Under Law. Deborah Cole, a 56-year-old woman in the hospitality industry, said while she left impressed by Mr. Biden, she was frustrated with Mr. Bloomberg. “Stop and frisk was not a good move and that measure contributed to young black men getting killed,” she said. Mr. Bloomberg has defended the tactic, saying it had helped lower New York’s murder rate. The breakfast in Washington, held by the National Action Network founded by Rev. Al Sharpton, was one of several events related to the King holiday that featured either current presidential candidates or Democrats said to be considering a 2020 run. Senators Bernie Sanders of Vermont and Cory Booker of New Jersey attended an event in the early primary state of South Carolina. Two candidates who have declared they are running, Senators Kirsten Gillibrand of New York and Elizabeth Warren of Massachusetts also attended events commemorating King’s legacy. Mr. Bloomberg spoke of several illuminating moments that he said had shaped his recent thinking about race. In one example, Mr. Bloomberg said he recently learned about the deadly race riots in which white residents destroyed the Greenwood district of Tulsa, Okla., in 1921 and murdered several dozen black residents. Several audience members said they appreciated the explicit nature with which Mr. Bloomberg and Mr. Biden spoke to King’s legacy and the issues of civil rights. Still, in terms of whether their reckoning with their past policies was adequate, the consensus was far less certain. “It all just sounds like 2020 is getting closer,” said Christian Taylor, a 29-year-old consultant who attended the breakfast.